"Will you follow me… one last time?" The beginning of the end. Warner Bros has debuted the first teaser trailer for Peter Jackson's The Hobbit: The Battle of the Five Armies, the grand finale in his Middle Earth series, and it looks to be a very nostalgic and exciting ending. Martin Freeman returns as Bilbo, Luke Evans as Bard, Richard Armitage as Thorin, Ian McKellen as Gandalf, and everyone else they have in the illustrious cast. As this is the first teaser, it doesn't reveal too much footage, but does hint at how epic the "Battle of the Five Armies" will be and how he's trying to match the tone of Lord of the Rings, so it can lead right into Fellowship. I'm really looking forward to seeing this sure-to-be spectacular Hobbit finale. It's Pippin. And you'll be fine. I figure PJ can't butcher anything for you if you can't even keep characters straight. Whoops on me, got em confused. Interesting...I like this trailer. It seems to have the best "middle earth" vibe of the three Hobbit trilogy trailers. Excited to see this in theaters! Is the Merry singing a nod towards heavy connections with the LOTR trilogy we will likely be seeing in this film? Simply amazing and awe inspiring. Peter Jackson is taking the term "saving the best for last" to a whole new level. Though The Battle of the Five Armies cannot top the masterpiece that was Return of the King, or any film of the original trilogy for that matter, this final chapter is a going to be THE epic lay to rest and will be THE perfect ending. Love that they used pippins song from ROTK. This one looks like it is closest o the grandeur of the original trilogy. I got chills from that teaser - we'll be there as soon as it hits the theatre!!! Lovely trailer. Relaxing and kinda sad. Breath of fresh air. Now this is the Peter Jackson that I've been waiting for during the Hobbit films! Totally agree. It was damn awful. LOTR had a lot of noticeable cgi issues even upon release...especially with legolas. Considering it was WETA's first foray into mainstream Hollywood, I think LOTR was a triumph. Not being contrary, but I think it should just be pointed out. There was some beautiful cgi, no doubt. Total over use of CGI.. just because . Looks god awful just like the first 2 did/were. "he's trying to match the tone of Lord of the Rings, so it can lead right into Fellowship." Reminds me of Lucas and Revenge Of The Sith trying to match the tone of the originals. Unfortunately "An Unexpected Journey" was so disappointing that I've lost interest in this franchise. I haven't seen "Desolation of Smaug". And even ComicBookGirl19 said she skipped it because she couldn't be bothered watching "another CGI fuckfest". I tend to agree. Huge fan of LOTR. Was super keen for the Hobbit at first. But now have huge apathy toward this CGI trilogy made from one tiny book. 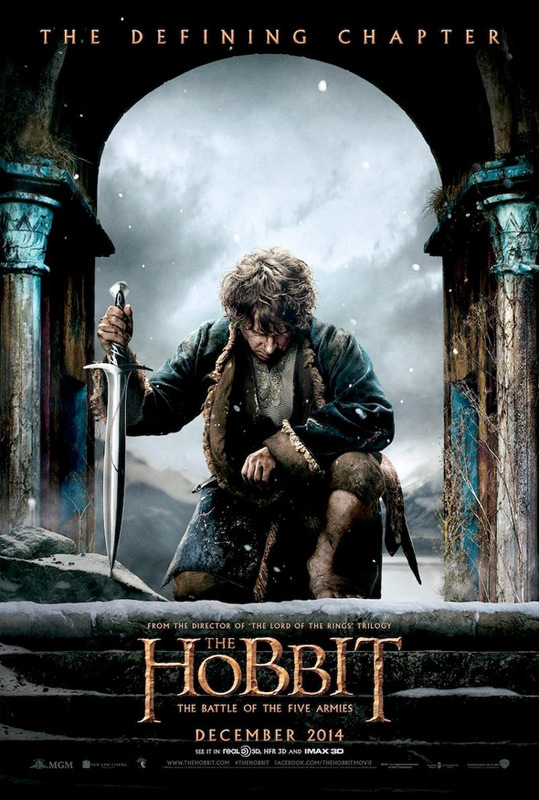 What a pity Jackson didn't deliver it as a singular, but superb, Hobbit film. Same here, except I did see DoS and I liked it much more than the first. Still bummed about all the unnecessary CG. For example there is a scene in the second film with spiders, and it looks great. But too many other scenes undo the whole thing. I think the second worked better for me though because the plot finally picks up. In the first one I didn't have a feel for the stakes, which isn't always necessary for adventure movies, but following Rings I guess I just expected it. Glad to hear that the plot picks up - I agree completely with not having "a feel for the stakes". There was of course a huge, overwhelming sense of foreboding in LOTR. And I realize The Hobbit (book) was never meant to have that same level of tension. But I felt like the film wanted to trick us into feeling the same vibe, even though audiences knew that a dragon hoarding gold in a cave somewhere could never compare to Sauron. Thus it was easy to forget what the whole point of the film was, especially when they were busy stretching out the running time via irrelevant sequences (like packing dinnerware away). It is a kids movie...that dinnerware scene is awesome...for the kid in me at least. Stop comparing it to lotr. These movies are very well done once they are not compared. the trailer was great. Will be there opening night. BORING. More of the same BS that we all hated from the first 2 returns. Pretty piss poor trilogy. the first 2 movies both made around a BILLION dollars each - just who are these "all" you are referring too??? I think the "all" he's referring to is just himself. huh yeah like the money is prove that they were good movies? Transformers just made over a billion. That means what? Aside from Video game like CGI, terrible slapstick humor and repetitive camera movements i can't remember much from the first two Hobbit movies. Except Howard Shores music is always brilliant. It means the public likes it, and unfortunately, when it comes to a movie studio, that's all that matters. It's a business, and a business needs and wants money. you're right about money does not prove a movie is good. but the movies are popular. and btw - you and the other handful of haters are very wrong about the 2 hobbit movies - they're great fun and have some emotional moments. I could list quite a few if I wanted but what difference would it make? are you going to renounce your hate?...no. so, you haters can make your negative comments all you want. nothing you type or say can change the fact that the 3rd movie is going to be big in every sense of the word and I'm sure (based on first 2) will be a great watch. Listen John Doe or Dan, maybe get a real profile going so that when your spewing your BS your at least do it not anonymously. Hate? renounce? This isn't about politics. This is about opinions of movies. Do you see me calling you names for liking them? Brah, if you love em more power to you. However I can still post my somewhat negative opinion on something im passionate about. You can decide to ignore or respond in a somewhat non troll fan boy way. grow up - i called you out. don't like it? that's your problem. I for one am very excited for this film. It looks like they are going to nail it. From the trailer, it appears this final film will end on a sad note, only to be resolved many, many years later by Frodo. My wife and I spend time in January, sometimes February, taking one weekend to watch the LOTR trilogy. I look forward to adding this to our tradition. The defining chapter. This movie will either create the bond that is lacking, or leave it at that and we end up with three movies with a bunch of characters we never had any connection with. I'm still amazed at how much people complain about CGI with over 4 months before the movie is released. Haters gon' hate, right Quanah? I just recently watched Desolation of Smaug. The first film was so mind numbingly boring that I didnt want to spend money on the second part while it was in theaters. I am kind of upset about that now because its was miles better than the first. And since this one seems to be more action oriented I'll see it in theaters. So will this show the battle that is at the beginning of FOTR? Also did I see them in the trailer pulling the old 'we're meant to believe that Gandalf is dead' when the elf kisses him? Maybe the most underwhelming trailer I've ever seen. Cause the hobbit is a whimiscal tale. Goofy fighting is more than welcome.